I have a 20V 2.25A laptop power supply that i want to split 3 ways to charge 3 X NiMH battery packs simultaneously (5000,2000,2000 MAh each @ 7.2V). My plan is to use 3 of these XL-4015 dc to dc step down modules to regulate the voltage and amperage. My question is how can i stop the battery from charging when its full without me having to monitor them. NiMh batteries requires 1.4V per cell to charge full, the data provided indicates it's a 6 cell pack. 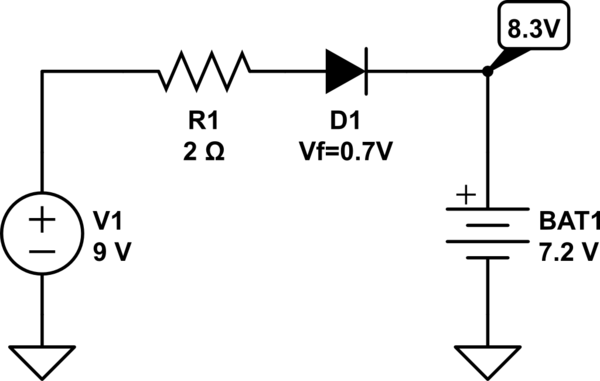 I assume you have limited component on hand, I give you the below circuit. It will charge the battery to about 90% full and you can leave it to charge overnight; without damaging anything. Make sure the resistor is 2W and the diode is rated 2A for safety. Do make sure the BAT1 terminal is at 8.3V max after long period of charge. Technical: Reduce R1 to 1 ohm will increase the charging current, allows faster charging time. D1 is normal diode, not schottky diode; some may spec 0.6V forward voltage. You may want to start the V1 (dc-dc) voltage at 8.7V to have a feel first. Not the answer you're looking for? Browse other questions tagged power-supply battery-charging step-down split or ask your own question.